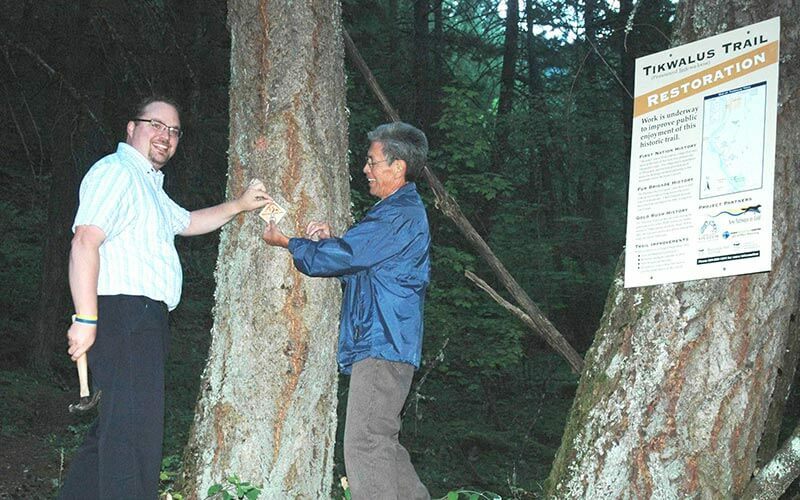 (SPUZZUM) Chilliwack-Fraser Canyon MP Mark Strahl and Spuzzum First Nation Chief Mel Bobb unveiled a trail marker here today that was a milestone in more ways than one. The “Kilometre Zero” marker doesn’t just herald the start of work on the Tikwalus Trail above Alexandra Lodge. It marks the beginning of a facelift for Alexandra Bridge Provincial Park being coordinated by the New Pathways to Gold Society. Bobb said he is glad the trail restoration will articulate some of the 10,000 years of Spuzzum First Nations’ history in the park. The Tikwalus Trail was used by the Hudson’s Bay Company’s fur brigades in 1847 and 1848, but was abandoned in favour of a route between present-day Hope and Princeton. The current trail is a 12.7-kilometre-long loop on the eastern side of Alexandra Bridge Provincial Park. “Without the assistance of the federal government funding received since its inception in April 2007, NPTGS would never have evolved to be in position to build partnerships such as the one we have with the Spuzzum First Nation to upgrade the Tikwalus Trail, as well as the other major projects currently being managed by the Society,” said NPTGS Co-chair Cheryl Chapman. Restoring the trail is just the first step in revitalizing the entire 55-hectare Alexandra Bridge Provincial Park, says NPTGS Co-chair Terry Raymond. Raymond said improvements to the park highway pullout – including a revamped information kiosk, new picnic tables and wheelchair accessible outhouses – are key features of the next stage of park restoration. Other improvements include work on interpretive signs to bring alive the many story strands within the park and bringing its history to life. That history also includes intact sections of the Cariboo Waggon Road and the 1926 Trans-Canada Highway, says Kelly Pearce of the Hope Outdoor Centre, whose organization is working in partnership with the Spuzzum First Nation in planning and delivery of the project. Raymond, Bobb, Chapman and Pearce were among those who toured Strahl through the park’s western half, overlooking the Fraser River. Its centrepiece is the 1926 Alexandra Bridge (which is outside the park boundaries and maintained by the Ministry of Transportation and Infrastructure). “With ten millennia of First Nations occupation and use, stories from the Fur Trade and Gold Rush era mixed in with the building of the national railways and the original Trans-Canada Highway, this park is a microcosm of B.C.’s entire history,” said Raymond. Key participants in the project include BC Parks, Ministry of Transportation and Infrastructure, New Pathways to Gold Society, Spuzzum First Nation and Hope Mountain Centre.